Just because the snow has flown doesn’t have mean you are done running for the winter or sentenced to the treadmill. Snowshoeing social clubs can get you out and introduce you to similarly health conscious, adventurous and even eco-friendly people. Alternatively, fundraising for your favorite organization or participating in a snowshoe walk/run race can get your blood pumping and quench your thirst for competition. If you have enough friends and don’t need to compete to get your aerobic exercise, winter walking holidays in Europe may be up your snowshoe ally. 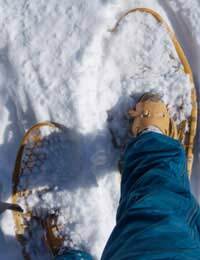 ClubsSnowshoeing clubs organize groups for snowshoe outings in your area. Singles, mixed, gender specific and other group specific hikes may be available depending on the prevalence of snowshoeing in your area. Many clubs offer wilderness survival and avalanche safety workshops, technique clinics and equipment information and swaps. Yeti Snowshoe Academy, in Canada, teaches snow running for all levels and organizes fun races. Other snowshoe and outdoor adventure clubs channel their resources, member labor and dues, into conservation of area wilderness, from volunteering for trail maintenance to lobbying for environmental bills.To find a club near you ask at your local outdoor sports shop or search online. Keep in mind some ski and snowboard clubs include snowshoeing. Snowshoe Magazine’s website lists American and Canadian snowshoe specific clubs, as does winterfeelsgood.com. If no club exists in your area, gather a group of friends and start your own, anywhere there is snow can be your playground. RacesUntil snowshoeing becomes popular and organized in 40 countries, it will not be part of the Olympic Winter Games, but there are plenty of competitions around in the meantime. Local chapters of illness-research fundraising organizations like the Muscular Dystrophy, Breast Cancer and Multiple Sclerosis associations, as well as the March of Dimes hold snowshoe races as a counterpart to their summer 5k walk/run races. Casual racers and athletic participants can find US races listed on active.com. Trail Running Magazine’s website lists races all over the world, both for running and snowshoeing. The Yeti Snowshoe Series sponsors five fun races across Canada. In participation with the Yeti, the Mad Trapper Snowshoe Series will host three other races for the 2007 Canadian National Snowshoe Championship. Series champions will be determined by the combined point totals of the three Mad Trapper 10km races. Top finishers get awards and all participants can enter the raffle to win prizes. The US Snowshoe Association (USSSA) sanctions events all over the US, culminating in the US National Snowshoe Championship. Unlike the Canadian race series’ the USSSA Championship requires qualifying at a regional contest. Top finishers in each age group receive awards. Only the US, Canada, Finland, France and Japan have snowshoeing governing bodies, so many international races are hosted by cities within each country and are not connected. The Snowrunning Championship in Soldeu, Andorra is a 13.5 km race known as the European Snowshoe Cup. Other big races include the Racchettinvalle in Pragelato, Italy, as well as the La Ciaspolada in Fondo, Italy; both are open to walkers and runners. Japan, Finland, Switzerland, Austria, France and Turkey hold their own National Championships, most of which also have a fun or non-competitive category, though finding information in English can be difficult. Distance snowshoe runners should check out the Snowshoe Marathon and Half Marathon in Pittsfield, Vermont; the course traverses back roads and un-groomed trails. The North Pole Marathon takes snowshoe runners over Arctic ice floes, 26.2 miles to the Geographic North Pole. If that’s not crazy enough, try the grand slam by completing marathons on all seven continents including Antarctica. The Antarctic Ice Marathon and 100km Ultra Race take place at 80 Degrees South, just a few hundred miles from the South Pole at the foot of the Ellsworth Mountains. Participants choose between trail running shoes and snowshoes. HolidaysFor those of us who enjoy more leisurely snowshoe treks, European resorts offer guided and unguided holiday snowshoeing packages. Guests can choose the number of miles and days they wish to explore the Alps and Apennines. With packed lunches, your own pacing and cozy chalets to return to, snowshoeing holidays combine outdoor exercise, adventure and relaxation. Snowshoeing is a great way to exercise in the winter, and joining a club, taking a vacation or participating in a race provides the perfect environment for every level of enthusiast.